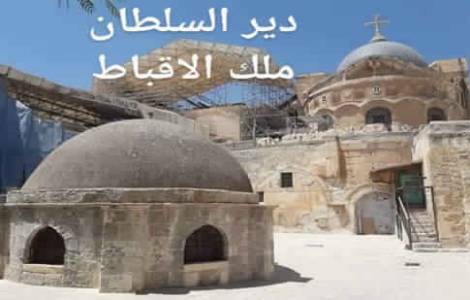 Jerusalem (Agenzia Fides) - The contrast between the Coptic Orthodox Church and the Tewahedo Orthodox Church of Ethiopia about the dispute on Deir el Sultan monastery, the place of worship placed on a roof terrace of the Basilica of the Holy Sepulcher of which both Churches claim property rights, is being analyzed. The biennial plenary meeting of the Holy Synod of the Tewahedo Orthodox Church, held in recent days in Ethiopia, has prepared to send a letter of appreciation to the Government of Israel for having ensured the beginning of the restoration of Deir el Sultan monastery, without be influenced by attempts made by members of the Coptic Orthodox Church to block the urgent restoration work. This is reported by sources of the same Tewahedo Orthodox Church, also announcing a media campaign aimed at demonstrating that the monastery belongs to the Orthodox Church of Ethiopia, and denying the versions on the history of the disputed monastery that attribute its property rights to the Coptic Orthodox Church. The dispute over the monastery is actually failing the recent attempts of rapprochement between the Coptic Church and the Orthodox Church of Ethiopia. In January 2015 (see Fides, 17/1/2015) the visit to Egypt by the Ethiopian Orthodox Patriarch Mathias had marked an important step in overcoming past contrasts between the two Churches. The Orthodox Church of Ethiopia was jurisdictionally bound to the Coptic Patriarchate of Alexandria until 1959, year when it was recognized as autocephalous Church from the Coptic Patriarch Cyril VI. On October 24 Coptic monks had been forcibly taken away by Israeli policemen while they were engaged in a sit-in to prevent Israel Antiquities Authority (IAA) maintenance workers into the monastery. A video of the incident that has circulated on social media shows several police officers handcuffing and dragging a monk, who refused to walk with them. The Egyptian Coptic monks claim the historical control of Deir Sultan monastery, which since 1970 has been totally occupied by monks of the Tewahedo Orthodox Church of Ethiopia. In order to repossess the monastery, the Egyptian Copts had also made a legal appeal to the Israeli Supreme Court, which in 1971 had ruled in their favor, even if this pronouncement had no consequences in practice. What started up the dispute again was the restoration work, planned with the consent of the Ethiopian monks, and that the Egyptian Coptic monks wanted to prevent in order to avoid it from turning into a sort of implicit legal certification of the current management of the monastery, which they considered illegitimate.